Why do I Need to Change My Air Filter & How do I do it? Regularly changing the air filter in your air conditioning unit is essential to not only for the continued efficiency of your system but also affects indoor air quality and the longevity of your system. A clogged, dirty filter affects the efficiency of your heating & air conditioning system because it reduces the air flow into your home, thereby reducing the cooling effects. As you feel less of the cooling effects, your system has to work harder and longer to try to meet the temperature settings you’ve set on your thermostat. The harder the system works, the less efficient and the higher your utility bills will be. A dirty filter also passes dust and other particles from the filter into your system and then distributes them back into your home. Your air supply as a result will be full of impurities and allergens that reduce the quality of air inside your home. The result of a dirty filter is also a decrease in the lifespan of your HVAC system. The build-up of dirt and dust can cause damage to parts like the blowing fan. An HVAC system that is working longer and harder also has a greater probably of breakdowns. When and How to change my air filter? In general, air filters should be changed every 30-60 days, if they are in regular use. You may also want to refer to the manufacturer’s instructions for the specific needs of your HVAC system. NOTE: If you have a washable filter check it on a regular basis and clean it as needed, following manufacture’s recommendations. Locate your furnace and the filter compartment. A strip of metal that slides in and out of place normally covers this compartment. Once you locate the air filter, check its size, which may be noted on the side of the device. You can also call the manufacturer for details or contact the HVAC technician that installed your system. Get the dimensions of your air filter and make sure to purchase the same size. You may even want to bring the old filter to the store with you to make sure you buy the correct replacement. There are a variety of filters available, ranging from inexpensive spun glass filters to pricier synthetic polyester fibers. You may want to consider high efficiency filters if you live in warmer, dustier climates, as they will capture more dust particles. If allergies are a concern for your family, you may want to consider an air purification system for your Raleigh area home. Use a black permanent marker when you change your filter. When you slide up the metal guard, note the direction of the air flow marked on the side of the old filter and draw arrows in the same direction on the metal guard. This way you will have no question which direction to insert the new filter. According to the EnergyStar, dirt and neglect are the top causes for cooling system inefficiency and failure. Changing the air filter on your air conditioning system is the least expensive thing you can do to maintain your home’s cooling system. 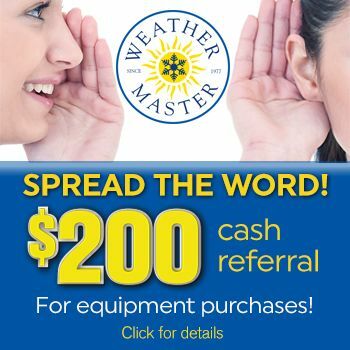 Weather Master Heating & Air Conditioning serves the Raleigh, North Carolina area and provides expert heating, air conditioning, plumbing and electrical services.